There are Resorts and Hotels in Kanchanaburi Province to suit all tastes and budgets. 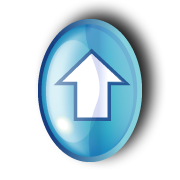 Whether you are looking for a family friendly resort, guest house, luxury tent or a floating river raft resort. You will be amazed how affordable and relatively cheap it is to stay a couple of nights in Kanchanaburi. 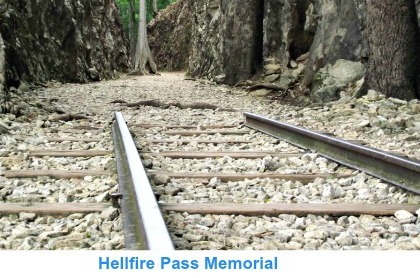 Allowing you the time you need to explore the many sights and attractions in the area. 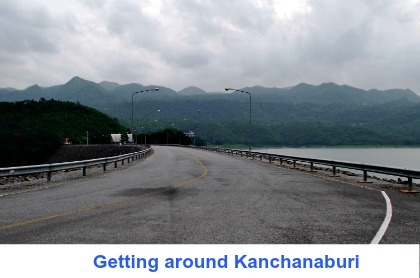 Kanchanaburi is quite spread out, and some of the attractions are located a good distance from the City it self. To make it easy to decide where to stay we have listed the resorts and hotels in Kanchanaburi by area in relation to the attractions and sights within that area. There are many budget priced guest houses, affordable hotels and resorts in Kanchanaburi City itself. The list below shows some of the best hotels in Kanchanaburi that are located close to the Bridge on the River Kwai. U Inchantree Kanchanaburi Hotel is situated on the banks of the River Kwai, with beautiful views of the river and within walking distance to the Bridge, restaurants and markets. Felix River Kwai Hotel is also situated on the banks of the River Kwai. 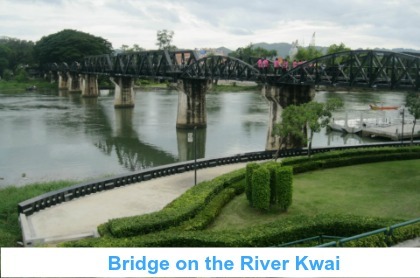 Just a ten minute walk across the bridge to all the activities in Kanchanaburi. The hotel features a range of spacious superior and deluxe rooms and a fantastic selection of suites. Sabai@Kan Resort is located about 10 to 15 minutes walk from the Bridge on the River Kwai. There is a fantastic selection of restaurants and bars just a short walk from the resort. Rooms on the ground floor overlooking the gardens and swimming pool are slightly larger then the rooms on the second floor, family rooms are available on both floors. The raft houses, hotels and resorts listed below are located on the outskirts of Kanchanaburi City. 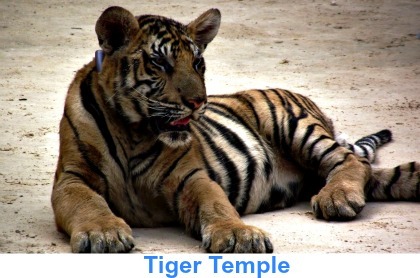 All of the following hotels and resorts offer a very relaxed and secluded atmosphere, located closer to attractions in Sai Yok, including the Tiger Temple, Hellfire Pass and Soi Yok Waterfalls. Hin Tok River Camp is a luxury tented camping resort set in a wonderful location overlooking the River Kwai. The tents are clean, spacious and are fitted out with modern amenities’ including a private bathroom and air conditioning. The River Camp provides all the comforts you just wouldn’t expect to find in a tent. 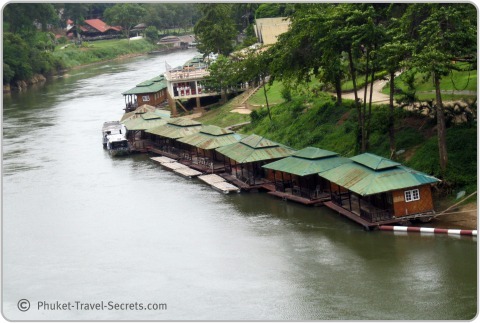 The Float House River Kwai Hotel is a luxury 4 star floating villa resort. The Villas are tastefully decorated with a range of modern facilities including air-conditioning and hot and cold water. River Kwai Jungle Rafts are another option if your looking to stay in a floating hotel on the River Kwai. The rooms are comfortable and clean with a private shower and toilet. River Kwai Resotel Resort provides a luxury alternative to a river raft. The resort has a range of private thatched roofed chalets; the chalets are spacious and feature a range of amenities. 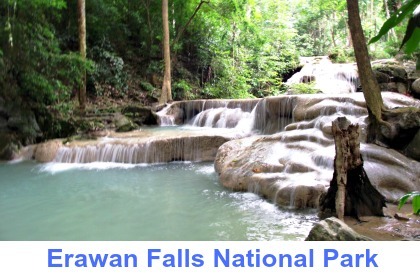 The resorts and hotels listed below are about 70 kilometres from Kanchanaburi City, close by attractions include the spectacular Erawan Waterfalls and National Park and the Si Nakharin Dam. Raya Buri Resort is located on the Si Nakharin Dam with spectacular views. Mida Resort is located on the highway to Erawan National Park, situated about 30 kms from Kanchanaburi City, and only 25km from Erawan Waterfalls. 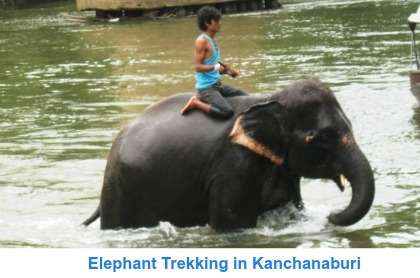 Our list is just a few of the many hotels and resorts in Kanchanaburi Province. Click on the link below to see the full list of resorts, guesthouses, river houses and hotels in Kanchanaburi Province Thailand.